The green line was my planned route. The red line is what I actually did. Read on to hear my tale of woe. 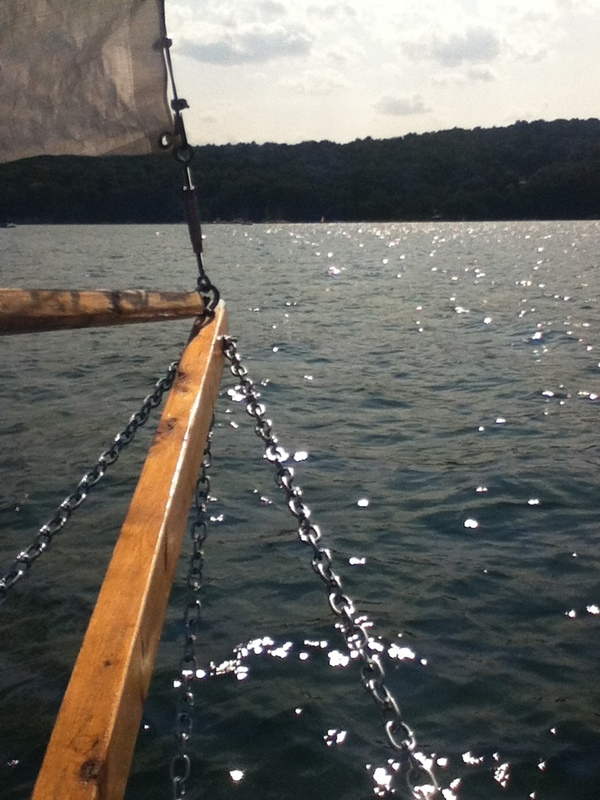 My new home of Ithaca is freshwater sailor’s paradise. Sitting on the southern tip of Lake Cayuga, there are at least three marinas within city limits. But finding my own path to the water was surprisingly difficult. 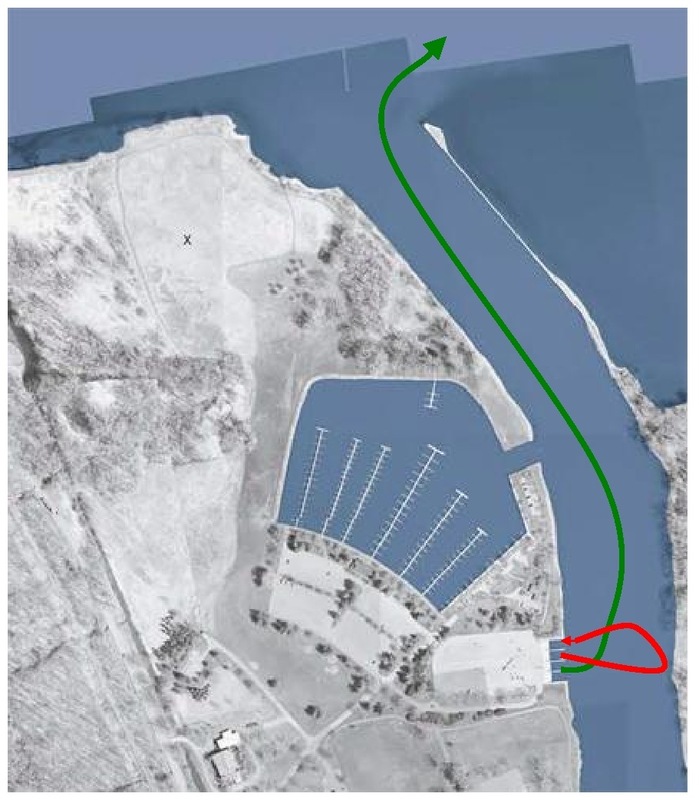 Here’s the problem: All of Ithaca’s marinas are located along a narrow, mile-long inlet—a partially manmade channel, as far as I can tell–that extends from the southern end of the lake and into the western edge of the city. It’s a bustling waterway; sailboats line docks, rented canoes and kayaks wander about with aimless enthusiasm, and a large tour boat embarks on regularly scheduled trips into the lake. But when I started calling marinas, looking for a place to park my trailer and launch my boat, I was turned away. The inlet, I was told, was too narrow to sail and the lake was too far away to paddle. Because I didn’t have a motor, I would have to take my boat elsewhere. I continued to make calls and eventually reached the very friendly owner of one the town’s scruffier boatyards. He listened to my dilemma and suggested that I try launching from a state-owned marina near the mouth of the lake. The park’s boat ramps were still in the inlet, he explained, but closer to open water; maybe I could sail out from there. As for storing the boat, he had space in one of his open sided sheds and would give me a late season discount. I gratefully accepted his offer, checked this problem off my moving to do list, and continued packing up our Pennsylvania home. We moved like Okies. My wife drove our good car with two vomiting cats, my oldest son drove the unreliable Subaru station wagon, and I followed in the U-Haul—with the sailboat hitched behind. We moved slowly and stopped often, but arrived safely. By our second day in Ithaca I had the boat tucked away at the boatyard and for the next two or three weeks I was fully occupied by the excitement of exploring our new town. Even outings for the most prosaic reasons—groceries, gas, shower curtains—were infused with a sense of adventure. With road map in hand, we would find our way to the supermarket, the hardware store, the downtown shopping district, exclaiming like tourists in a foreign land as we explored each. But once our furniture was arranged and our suitcases unpacked, I began to think about the boat. I knew that I should sail. Summer was nearly over and the long New York winter would soon begin; it would be wrong to let the season pass. Yet I hesitated. Publicly, I blamed my delay on work or the weather. Privately, I acknowledged that I was intimidated by my new homeport. Sailing on Pennsylvania’s Lake Nockamixon was like playing in the little leagues; we were all amateurs and the lake was small. But this was the big time. Lake Cayuga felt massive and many of the boats docked around town represented the “A” list of America’s nautical heritage. In Pennsylvania, I received accolades simply because I was the only wooden boat on the water, but here I competed with ocean going keelboats, restored Chris-Craft cabin cruisers, elegant cat boats, and a half dozen other vessels ready for the cover of Wood Boat magazine. I suddenly felt like a country kid coming into town with a torn suitcase and straw in my hair—hot stuff back home, but an object of derision in the big city. All of my insecurities emerged and I worried about launching my boat in front of people with years of real sailing experience. But I couldn’t delay forever so I picked a sunny day with light winds. With my teenage twins, I picked up the boat, towed it a mile to the state marine park and surveyed the scene. Because it was also a weekday, I had hoped for an empty boat ramp and no witnesses. But to my dismay, the waterfront was a hive of activity. Several ramps were occupied with arriving or embarking powerboats as onlookers sat on the grass and park benches. My heart sank as I realized that my launching would be a public event. Small problems cropped up right away. Not until I started raising the mast—a task I complete while the boat is still on the trailer—did I realize that a turnbuckle was missing. It probably unwound itself and fell off during the drive to New York, but it had to be replaced before I could secure the mast and get underway. While the kids waited by the boat, I drove to a nearby hardware store (making a few wrong turns down unfamiliar streets) and bought a new one. Back at the boat, it took at least half an hour to put it all together. By now it was a hot, cloudless day. Jumping on and off the boat from the steaming parking lot exhausted me and by the time the mast was finally raised, I was covered in sweat. Already tired, I backed the trailer—somewhat inelegantly—down the ramp and, with help from my kids, quickly pushed the boat into the water. After parking the trailer, I jumped aboard and announced that we were ready to go. That’s when the second problem became obvious. In my rush to get going, I forgot to install the rudder, which I had removed from the transom before the move. While the boat started drifting away from the dock, I threw myself into the cabin, pulled out the rudder and pounded it into place while leaning so far out of the boat I nearly tumbled into the water. Even under ideal conditions, I often struggle to attach the rudder and normally use a hammer to fit the pins into the homemade hinges. Without tools, I accomplished the task with a bare fist and adrenaline. I collapsed into the boat with a sore hand and a shaking arm. Still, there was no time to rest; we were in open water and I needed to raise the sail. So with my son at the tiller, I stepped forward and started hauling up the halyard and gaff lines as quickly as possible. And here, inevitably, was where the third problem emerged. Working too quickly, I let lines get tangled around pulleys at the top of the mast. The sail went up, but not quite all the way; it looked sloppy and the one real features of my boat—cool gaff rigging—was marred by the mistake. But I didn’t have time to drop the sail and straighten out the lines because the final and, ultimately, most serious problem was now becoming apparent: The wind had died and we were adrift. I had never done this before, but I felt it was possible. I had read stories about sailboats much larger than mine “short tacking” their way up rivers and narrow waterways. But without wind, tacking–or any other form of controlled movement–now existed in the realm of idle speculation. Waiting for the wind to pick up was not a solution either. Once we were on the water, I ruefully acknowledged that the inlet was probably too narrow for tacking in my boat and that I would be a hazard to navigation if I tried. With so many powerboats heading in both directions, any attempt to zig zag up the inlet while under sail would be like driving a very slow car back and forth across four lanes of Interstate traffic. As a plan, it was both impractical and dangerous. By now, we had more or less drifted to the opposite bank. With my kids at the tiller, I grabbed a paddle with the immediate goal of avoiding the shore and the possible long term goal of paddling all the way to the lake. I don’t know why I thought this was possible; I was hot, thirsty, drenched in sweat, and a little bit sunburned. Clearly, I didn’t have the energy required to accomplish such an Olympian task. But I think I was motivated by a strong desire to get away from the boat ramp which, after all this time and effort, was still just a stone’s throw away. I imagined that a dozen eyes were watching our hapless struggle. Digging into the water with my little paddle, the boat moved as if through glue. Time slowed and passing boats became an indistinguishable blur of movement. And this was when I hit the low point of my day—and of my sailing career to date. Amid my struggles, the captain of a passing motor boat hailed me from a short distance away and, pointing to my mast, said something that my brain could not properly process, but was definitely not a complement. In a tone of reproach, it sounded like “Your luff is loose,” or maybe, “Your halyard is hashed,” but in either case I knew what he was driving at and the note of judgment was clear enough. Because I was beyond rational thought and coherent communication, I simply paused in my paddling and offered him a weary shrug in reply. Inexplicably, he shrugged back and roared off. I took this as a sign from God that it was time to give up. Having achieved both failure and humiliation—the twin horsemen of my nautical nightmares—I told my kids that it we should go home. Slowing, publicly, I paddled us back to the launch we had left only a short time before. Our total journey on our very first outing was about 200 nautical feet—and we never even reached Lake Cayuga. I pulled the boat out of the water and solemnly drove it back its storage space in the nearby boatyard. I closed the cabin hatch, locked the trailer to a post, and drove away. 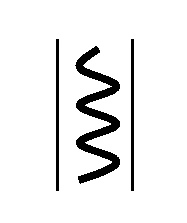 And there it stayed until the following spring. 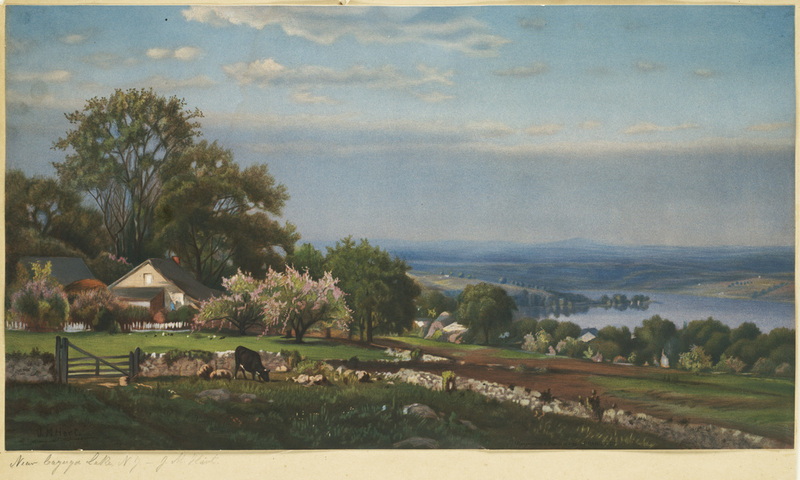 A nineteenth century view of Lake Cayuga. Remarkably, it still looks like this in some places. I started building my boat because, to be honest, I was unhappy. And one cause of my unhappiness was our home. Ten years ago we bought a 200-year-old stone house in a semi-rural corner of eastern Pennsylvania, charmed by the exposed beams, pine floors and deep window wells. Smitten by the house, we were tone deaf to the culture of the surrounding community. While I lived by the rules of suburban conventionality (be quiet, be tidy, be polite), my neighbors surprised me by, for example, firing guns from their back porches after a night of heavy drinking and idling Harley motorcycles in their front yards. Most were friendly, but none could figure us out. I worked at home and, as one neighbor summarized, “did something with computers.” We could chat about the weather, but wisely avoided religion, politics and professional sports (about which I know absolutely nothing). I was starved for intellectual companionship, but found none. To buck up my spirits, I made frequent trips to distant cities, just to sit in cafes, browse bookstores, and see people who shared a similar set of life experiences. Because I disliked our community, I grew resentful of our house. In previous homes, I was always mister fix-it, eager to paint, patch, build and garden. But our ancient, crumbling home defeated me. I didn’t have the energy or enthusiasm needed to keep up with the weeds, the peeling paint, the rotting windowsills, or the leaky roof and I resented every dollar spent on antique septic systems, faulty electrical wiring, and crumbing stucco. Yet leaving didn’t feel like an option. Because the real estate market was dead in our blue collar community, we felt trapped. Sailing was, in this way, more than a psychological escape. It was, to some extent, the dream of physical escape. As I worked in my garage, I felt like an inmate at Alcatraz, secretly building my raft to freedom. These dreams of serenely gliding to Bora Bora grew more vivid every time the local Harley bike club roared by– twenty, thirty, forty bikes at a time—violating every municipal noise ordinance devised in the Western world. And I redoubled my efforts when reminded that the “grand dragon” of the local KKK lived just down the road. And then, one day, I finished building my boat. I loaded it on a trailer, drove it to a lake, sailed around, and then…came home. A few hours had passed—I was tan and happy—but nothing fundamental had changed. A small boat on an inland lake was, quite obviously, not going to take me away from my house. And a few trips on the Chesapeake wouldn’t magically heal a leaky roof, or produce a neighbor eager to chat about art, history, or philosophy. The boat was a kind of therapy when I needed hope and a distraction. But it was not a real solution to my problems. Obviously, the only real way to get away was to leave in a more conventional manner: Put up a for sale sign, pack boxes, rent a U-Haul truck and drive off. And two months after I finished the boat, that’s what we did. The market was still bad, but we no longer cared. Life is short and we were miserable. I sometimes wonder what role, if any, my boat building project really had on the timing of our move. Did the effort and emotional energy devoted to building the boat delay the day of reckoning and keep us tied to Pennsylvania longer than necessary? Possibly. But I think the opposite is true. I believe that building a boat helped me imagine a richer life and articulate my values and my dreams. It could not be the means of my physical escape, but it nurtured the emotional fortitude needed to make a change that was complex and financially unwise. On the rebound, we decided to find a town that was, to the greatest extent possible, the exact opposite of everything we experienced in rural Pennsylvania. After many exploratory trips—Asheville, North Carolina; Bisbee, Arizona; Shepherdstown, West Virginia; Portland, Oregon—we settled on Ithaca, New York, which is home to Cornell University and a well-known outpost of progressive thought. How much cooler is Ithaca? Well, it has four bookstores within four square blocks and actually supports a multiplex art movie house. I can go to a different café every day of the week– and agonize over which one makes the better cappuccino. And, oh, yes, it happens to sit on the shore of Lake Cayuga, the largest of New York’s famed Finger Lakes. Only a few miles wide, but 38 miles long, it is filled with dozens of sailboats, both large and small, on breezy summer days. Officially, the lake was not a factor in our decision-making, but, unofficially, I was consulting charts even before we found a house to rent. And that’s when I discovered that the lake is also connected to the famed Erie Canal, which meant—get this!–that I could embark from my home and sail, unimpeded, all the way to the Great Lakes or the Atlantic and destinations beyond. My mind reeled at the possibilities: Montreal, New Orleans, and Bimini were all there for the taking, requiring only a right turn or left turn once I reached the top of my lake. My dream of sailing away was rekindled and burned bright. The move was hard and stressful. Our Pennsylvania house didn’t sell and when it finally did, nine months after we left, it went for a firesale price. But we never regretted the decision to leave, or our choice of destinations. For the first six months, I walked around town with a goofy “pinch-me” smile and drank up the artsy-bookish culture like a man who had nearly died of thirst. I marveled that people related to my work as writer and we found ourselves in the disorienting position of not being the most liberal people in the county. My kids liked their new school and my wife started making connections that would lead to rewarding employment. All was right with the world—except for one thing: I had not yet sailed my boat. And accomplishing this goal turned out to be an unexpectedly difficult and, initially, humiliating task. Launching my boat marked was a major accomplishment and proved—to myself and others—that I had the competence and sheer stubborn determination to see a project through. However, building was only the first step. As I have said time and again, the dream of building a sailboat was, at its heart, driven by the fantasy of escape. The animating force was a desire to glide away–silently, competently, self-sufficiently–from my problems and find a life of happiness and contentment. It was a very powerful goal and it kept me motivated for three long years while I cut wood, glued boards, sanded epoxy, and puzzled over an endless procession of technical problems. Of course, I would come back home after completing my adventure; I never wanted to run away from my family. But a cathartic dream of escape fueled all of my labors. However, once the boat was completed and, especially, once it was sailed, I was forced to examine this fantasy and, over the past year, I came to the inevitable conclusion that my boat is just too small. I don’t mean that it’s physically too small; I’m not talking about its ability to withstand a journey or survive wind and waves. Instead, I am talking about the ability of the boat to hold all my dreams and to solve all of my problems. Against this expectation, my boat—any boat—is not up to the task. Sailing away, while exciting to think about, could not offer the solutions to problems that triggered the whole enterprise. But—and here’s a very important point—I decided that this is ok. As I roamed around Pennsylvania’s Lake Nockamixon, searching for wind, trimming the sails, cracking jokes with my teenage kids, anchoring, and plotting a course for home at the end of the day—I decided that the happiness I felt for those few hours was enough. More than enough, really. Although tame and brief, these excursions offered me the kind of contentment that I thought would only come through a grand and dramatic gesture. In fact, I began to articulate a philosophy of life around the joy I felt during these hours. Happiness is not a goal to be won, I mused, but an activity to be experienced. It is not found in a distant and, probably, nonexistent port, but in all that I have done so far: dreaming, planning, building and—now—sailing on nearby lakes. These are the experiences to that make hours pass like minutes and help me feel better about the world in general. This is all good news in my opinion. Although I have yet to sail away from my homeport, I have already achieved my goals. I “sailed away” every time I spent a day in the garage building my boat and I continue to sail away every time I steal a few hours from my day for a spin around the lake. In many ways, I overestimated the importance of reaching the summit, but underestimated the satisfaction of pushing my rock. But what about my grand plan to sail to distant places? It’s alive and well, but for different reasons. I now view it as the next challenge, not as a dramatic conclusion to this little boat building drama. Increasingly, I see sailing away as the ongoing procession of adventures that will occur as build my skills as a sailor and explore new places. It is not one journey, but many. Launching and learning to sail around a midsized lake turned out to be the first goal. Building confidence at the tiller turned out to be the first challenge. But now I am ready to move on and, as it turns out, new opportunities are emerging. That’s what I’ll talk about in my next entry. You are currently browsing the Build a Boat, Sail Away blog archives for August, 2012.